The morning was cool and sunny and it would be another hot day. The last day of walking! An early rise with a strong conviction and anticipation that I would complete the distance. The friendly volunteer in the albergue had laid out bread and jam on the table and there was hot fresh coffee. A good donation was left for his kindness. Packing up, I thanked him for the kind hospitality and set off. He was full of happiness for me on my final day having come all the way from Le Puy-en-Velay. He merrily waved me goodbye. The Way entered some damp dark woodland for a short time before winding around the crystal blue waters of the coast. It was far before I discovered a small cafe. I sat alone having another coffee and enjoying the beach side atmosphere. A young dishevelled pilgrim arrived and we chatted. Lesse was from Esbjerg in Denmark. He had set out many months ago walking the coast of Belgium before crossing to England, then walking the South Coast Path and crossing again to France. 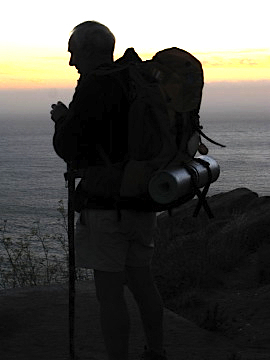 He had been walking many more months than I and was even more excited about arriving in Finisterre. 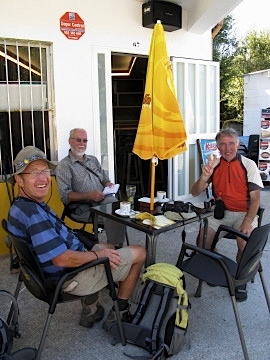 Some familiar faces arrived at the cafe and we all talked for a while. Soon, it was back to the road. Just after the cafe I bumped into Deirdré and Bernard again. 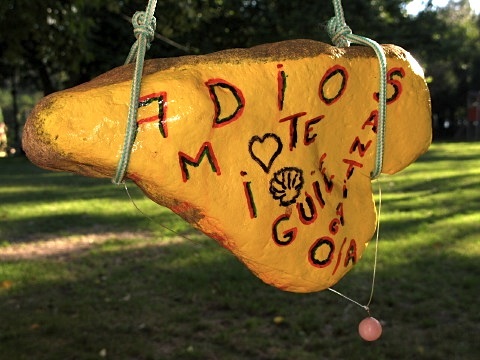 I was surprised as I thought that they had already returned to Santiago de Compostela. Finally, looking at Deirdé, I reached in my pocket and handed over the €20 saying nothing. It was the €20 that I had borrowed so long ago in O Cebreiro as I arrived in Galicia. I thanked her again before revealing that I was relieved to have repaid my debts before reaching the End of the World! It would save me posting it to her in Canada! 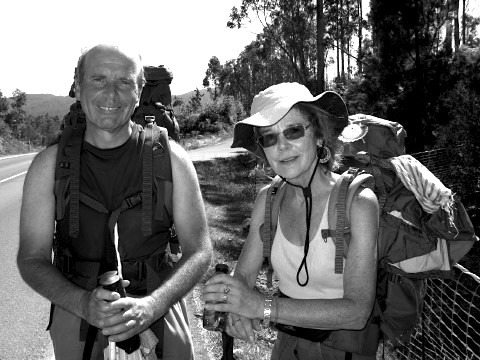 Both Bernard and Deirdré had decided to walk back to Santiago de Compostela. After heartfelt goodbyes, they disappeared into the distance. It had been good to walk and talk with them over the past few weeks. A small path cut the corner over the headland and back through nature. It was constantly comforting that I now felt more at home in nature that walking through towns and villages. There is a definite need for Human kind to connect with nature. 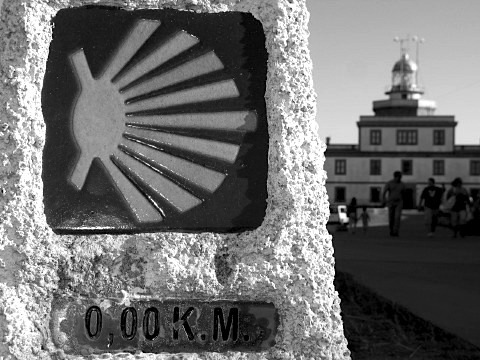 The Camino does this and helps with this important connection. The day was warming again as the Sun climbed high into the sky. Walking with Lesse, I reflected on Lorenzo’s comments that when he had taken the bus to Finisterre a few days before, there was nothing but mist. He saw none of the beauty of the coast. I was blessed with good weather. 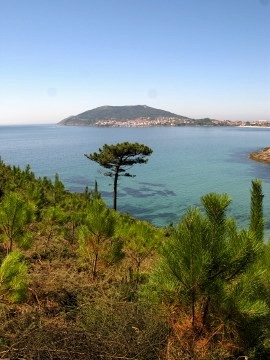 When we rounded a corner, there before us across brilliant azure waters, was the town of Finisterre. Lesse stopped in his tracks and dropped to the ground. His journey, greater than mine, and full of more reflection, caused him to be swept away by his emotions. It was his sadness at the journey coming to an end that affected him most. Before Finisterre was a huge wide bay. Locals and holiday makers were enjoying the warm shallow waters and other pilgrims were relaxing after reaching their goal. I stopped for a while and took a swim. Lesse followed as he could not wait for his first swim in the sea for quite a while. He ran into the warm waters shouting with joy. There on the beach there was Maria from Italy. Without asking, she offered me her bus ticket back to Santiago de Compostela. She had met some friends and would be getting a lift back. I gratefully accepted. Later I reflected on how the Way provided. I myself had only €15 in my pocket and when I tried to withdraw money from the bank, two machines rejected my card. A third would only give me €20! The kindness of Maria and the Way of Saint James had been a saviour and would allow me to have just enough money to return to Santiago in the morning. It was the end of the budget! Near the small harbour was the Provisional Albergue. The main albergue was closed for renovations. It was a large warehouse-type place with over 80 beds. The welcome was a little tense as I was questioned about the true distance I had walked. 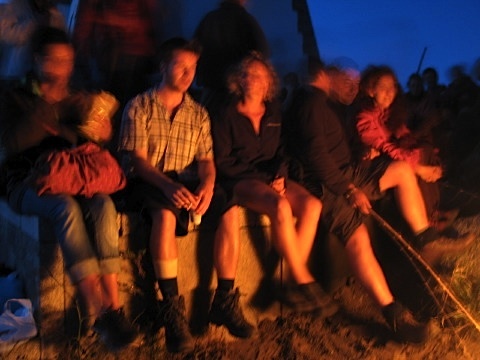 Many took the bus from Santiago de Compostela to claim their certificate in Finisterre. This was frowned upon. As soon as I produced my Credencial with all the stamps since Le Puy, the atmosphere changed. I was warmly welcomed, complete with a fascinating discussion on the Celtic history of this historic coast. After showering and changing and a couple of cold beers with Alex, Ray, Eva and many other familiar faces, it was time to prepare for the (relatively) short 3 km walk to the Cape. 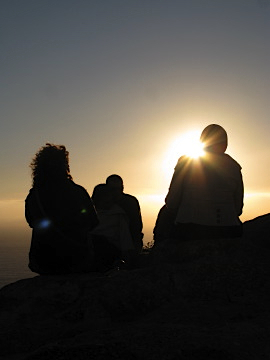 As is tradition, everyone was going to watch the sunset. There was relief and happiness about the prospect of touching the End of the Earth. Everyone had finished walking. The crowd at the cape was huge but, as the day trippers and motorised tourists left, the pilgrims remained. 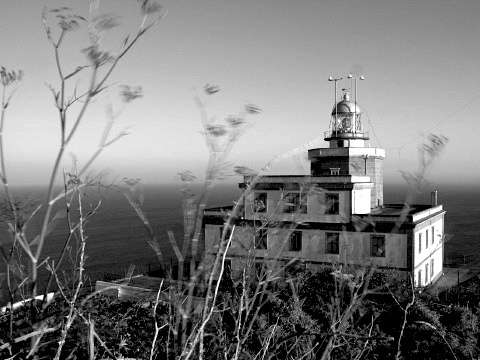 The lighthouse was perched on top of the huge cliffs. There was a final marker pronouncing 0 km. Everyone waited chatting about the great experiences they had had. The atmosphere was one of sheer delight, tiredness and restrained jubilation. The Sun was turning the sky a warm golden orange and the memories of my walk came flooding back. Some burned an old shirt or boot. Some raised their arms to the Sun and cried with delight. Others sat in circles in meditation. It was a special place and a special moment as the Sun finally set. A wave of calm then swept over the pilgrims. A hushed silence of disbelief about what we had experienced. Everyone had their personal experiences and remained in their own reflections, and in their own space, for some time. There was the distant smell of burning clothes mixed with the fresh salty air rushing up the cliffs. The waves crashed against the cliffs far below. The screech of seabirds that did not understand why we were all there. Maybe they did? In Le Puy-en-Velay I had many questions and no answers. Now I believed I had many answers. Somehow I could not clearly define the answers but it didn’t matter. It felt good. 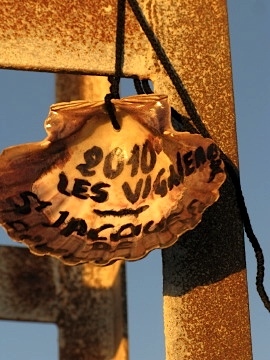 This entry was posted in From the Way and tagged Santiago de Compostela, Via Frances, Way of Saint James, Week Ten. Bookmark the permalink. Post a comment or leave a trackback: Trackback URL.